Run With Us in Wilmington, Delaware! The Rebel Runners meet on Thursday evenings and weekend mornings. On Thursdays at 6pm, you'll find us at Delcastle Recreational Area, near Pike Creek and Prices Corner. You're invited to join us for a run, which is always followed by food and beverages. Run with us once and you're eligible to be added to our email list. Thursdays at 6:00pm - This is our primary running location on Thursday evenings. 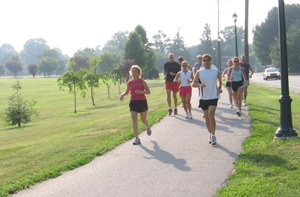 It is a popular 1.75 mile lighted loop around a beautiful park. From I-95 North or South: Exit at Rt. 141 North (Newport). Exit at Rt. 2 West (towards Newark). Make right at 3rd light onto Rt. 41 (towards Hockessin). Bear left at 1st light onto Milltown Rd. then make right at 1st light onto Duncan Rd. At end of Duncan Rd, the park is on your left. Go left at light and first left into Delcastle Tennis Center parking. Start/Finish line is right there.